On a steamy Tuesday night in June, a palpable energy settles over Shelter Cove Harbour as several thousand people gather for an evening experience like none other. Once again the annual HarbourFest celebration is underway, to culminate with a spectacular fireworks display at dusk. This unique waterfront festival will be enjoyed every Tuesday night from 6-9:30 p.m., now through August 11. For Hilton Head Islanders, the event is an opportunity to entertain friends and family and to take a mini-vacation from our everyday routines; for many of our visitors, HarbourFest is a vacation highlight and annual tradition. Originally from Chicago, now visiting from Charlotte, North Carolina, Rhonda and David Dorn, are here tonight with their daughters Maddie and McKenna, ages 5 and 10. The family has been attending for the past five summers. “Every time we come here, we come to Shelter Cove. I wish we had known about it sooner,” Rhonda said. Back for his twenty-seventh season, Tanner takes the stage in his famous propeller-topped beanie hat, delighting both children and adults with his high-energy performance of pop standards, sing-alongs, original ballads and children’s favorites. The summer show is distinctly family-oriented, with plenty of opportunities for audience participation. Youngsters are invited up to dance and sing while volunteers are selected to share the stage and perform solo. One of tonight’s future stars sang the classic, “This Little Light of Mine”; another performed “Let it Go” from the movie Frozen, each to thunderous applause and accolades from Tanner. During the break between the 6:30 and 8 p.m. sets, waiting in line to get her beanie hat signed (a legendary Shannon Tanner ritual), 24-year old Chelsea Nowak flashes a grown-up smile that reflects the joy of her inner child. Nowak says her family has been attending HarbourFest for over 20 years, before she was old enough to remember. The gang’s all here, including her older brother Nick, mom, dad and 84-year-old grandmother, Cynthia Egide, who started this cherished family tradition. In addition to dancing and singing with Tanner and clowning around with Cappy, children are creating sand sculptures, playing carnival games, posing with “Gary the Gator,” riding the Kidz Play Train, and expending some extra energy in the bouncy houses. 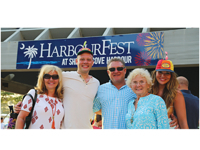 Mom, Nick, Dad, Cynthia and Chelsea have made HarbourFest a tradition for over 20 years. Meanwhile, shoppers duck in and out of the eclectic array of stores lining the harbor or peek in the windows for a preview. Retail establishments offer goods ranging from resort wear, souvenirs and gifts to designer clothing and fine art. During HarbourFest and other nightly events, sidewalk vendors add an assortment of handmade crafts, jewelry, handbags, T-shirts and toys to the mix. We caught up with Gretchen Adkins where Melvin Dean of “Steel the Show” was entertaining on the steel pan amidst a flurry of activity around the King Neptune statue. Popular activities include the Wild West Shootout, where everybody’s a winner, the Batter’s Box, where the fastest pitch wins, a hair wrap station and putting green. “I’ve been coming here since I was two,” said Adkins, who is visiting from West Virginia with Chris Fowler and their two daughters, Audrey, age 17 months and Ellen age four. Adkins’ parents are also along for the multi-generational experience. “It’s a family fun thing. 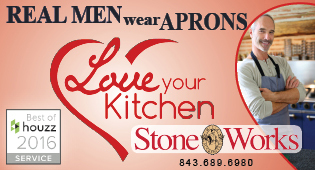 It’s good for everybody,” Adkins said. 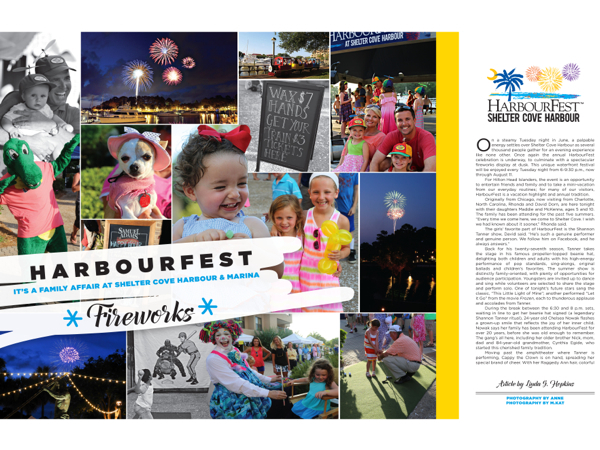 While HarbourFest started out as a means of promoting Shelter Cove, Palmetto Dunes and the surrounding businesses, over the years, the event has grown into an island-wide attraction that is nothing short of a phenomenon. All four major resort hotels as well as the rental management companies now recognize HarbourFest as a premier happening, encouraging their guests to attend. Local boat owners often choose to avoid the Tuesday night crowd and view the fireworks show from the water. Visitors can share that experience on The Holiday, an 80-foot double deck cruise ship, departing Shelter Cove Marina at 7 p.m. for a two-hour tour, returning in time to view the fireworks show from the boat. For a different perspective, visitors can take a guided kayak tour with Outside Hilton Head and enjoy an up-close view of the fireworks display along with a nature excursion. It is estimated that HarbourFest attracts over 60,000 visitors each summer season, with an average attendance of 2,500-5,000 per evening, swelling to 15,000 on the Fourth of July. If you are a first-time visitor to Hilton Head Island, HarbourFest is a must on your things-to-do list. 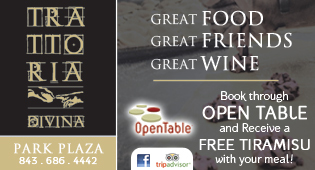 If you’re a local resident, celebrate your good fortune by bringing your summer guests or simply come mingle with the vacationers and remember the fun of being a tourist. Shelter Cove Harbour is located mid-island at 1 Harbourside Lane, across from Palmetto Dunes Oceanfront Resort. There is no charge for parking or entrance to the festival. 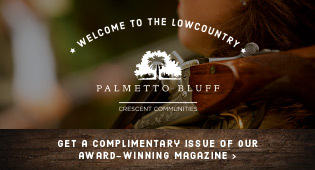 For more information or to see a video preview of the HarbourFest activities, visit palmettodunes.com/shelter-cove/hilton-head-harbourfest. Tanner also offers other activities associated with HarbourFest that give families a more personal experience with the beloved entertainer, including the Most Excellent Pirate Expedition. 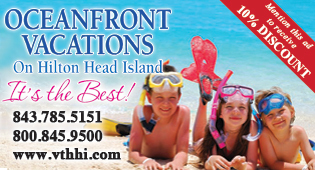 For more information or reservations, call (843) 422-0757 or visit piratekidzofhiltonhead.com. Don’t miss the special Saturday evening Fourth of July fireworks show, an expanded version of the Tuesday night celebration. Shelter Cove Harbour July 4 event and fireworks, the largest display on the island, will again offer two parking lots available for attendees, who will then be shuttled to the event. Secure auxiliary parking will be available at Chaplin Park off of Singleton Beach Road and at the Hargray parking lot along Highway 278. Traffic will be directed from 278 to the designated parking areas, and each lot will have onsite security officers. Attendees to the event can park for free at these lots, board one of several shuttles that will run continuously from 5 p.m.-11 p.m. and be dropped off at Shelter Cove Harbour for the fireworks and other entertainment. They can then catch the shuttle upon the conclusion of the event to be taken back to the parking lots. Attendees are encouraged to use these parking areas to ensure safe and smooth entry and exit from the event. Walking or riding bikes is another alternative to avoid parking and traffic problems. Those walking or biking from Palmetto Dunes Oceanfront Resort must use the pedestrian bridge that passes underneath Hwy 278 to bypass highway traffic. Shelter Cove Harbour fireworks over Broad Creek will take place at dusk on July 4 weather permitting for the set up and launch.